Fingerprint Cards, Sveriges nästa storbolag. : Huawei set to drop Ascend badge. Huawei is reportedly planning to drop the Ascend brand from its smartphone range, after having used the name on its consumer devices for some years. According to media reports, the company’s next flagship will be called Huawei P8, following on from the Huawei Ascend P7. Huawei has used the Ascend-brand across the bulk of its devices, with other designators used to differentiate specific product lines. For example, P-branded devices are flagships, Mate is used to identify phablets, and G is for “affordable premium” products. Huawei is also building its Honor range of devices for mass-market and direct-to-consumer sales. In some regions this is being positioned as a standalone. It was reported last year that Huawei is looking to reduce its own-brand low-end smartphone activities, as it looks to focus its efforts on higher-margin devices. It has also been suggested that P8 will make its debut at Mobile World Congress this year. This would mark a change for Huawei, which unveiled its predecessors at stand-alone events a little later in the year. Recent speculation indicates that the device will have a 5.2-inch full HD screen, and be powered by an octacore Huawei/HiSilicon processor with 3GB of RAM. Like Ascend Mate 7 (and rival products from Apple and Samsung), P8 is expected to include a fingerprint sensor. The device is also likely to have an aluminium body, as opposed to metal detailing on the Ascend P7. 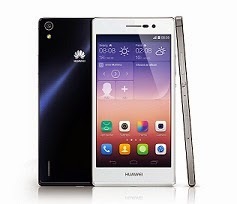 It has also been reported that Huawei is working on an “ultra high-end” smartphone, under the D8 codename. This is likely to feature a 5.5-inch 2K display, 64-bit processor, 4GB of RAM and 64GB of native storage.